Enter Felix the Fox, a professional investigator. In the business of ferreting out dark information for his clients, Felix is neither a traditional detective nor a traditional magician â€" but something in between. Drawing on his experience of dealing with the shady elements of society and on his aborted education in the magical arts, Felix dons his toga and sets out to discover the young manâ€™s killers. Welcome back everyone. Assaph, welcome back as well. Who's this gentleman you've got with you this evening? Allow me to introduce you to Felix, the protagonist of Murder In Absentia. Welcome Felix. Will you start us out by telling us a little about yourself? I am what you call in your world a private detective. People hire me to resolve their problems - problem that usually have an occult nature. That sounds ominous. Do you have any cases you can talk about, or is everything hush-hush? Oh, plenty of cases I can talk about. In a way, Assaph is just the scribe for my memoirs.I started to study at the Collegium Incantatorum, but was booted out. In a bizarre twist of fate, I worked for a couple of other detectives. I then took out to work on my own. Initially most of my cases were small game. Purloined jewellery, missing persons, cheating spouses were what paid for my bread and fish sauce. I was lucky with the occasional debunking of charlatans, confirmation of ancient scrolls, and even, rarely, a real magical ring. I thought those would be the highlight of my career, until that time I was called upon to help a senator. His son died in what looked like a cult's dark rite, you see. He needed someone who knows what's what, but that could keep things under wraps and away from the authorities.My career seem to have taken off after that, with word of mouth providing me with more and more high-profile cases. Sounds like you discovered a way into the dangerous cases. Ever wish you were still working the small change cases still? No, not really. For one, I like not worrying about when and where the next meal is coming from. For another, there were also... personal development associated with the cases. People I've met, you see, whose company I very much enjoy. I stand properly corrected. Yet, that leaves the question - how often do you have to watch over your shoulder in case someone doesn't like you investigating your current case? That happens. When the case is simple, there is usually not a lot to worry about. Small time crooks have a certain respect to one another.It's the high profile cases, those with the purple-bordered toga-wearing customers, that cause the most grief. They can get vindictive, and have long memories. Social events - when I am invited to them - can become an interesting exercise in navigation.As for my current case, by which I mean the one Assaph is currently writing down, there were certainly some unseemly developments. Dare I ask, or is that better left for the papers? That is best left for the eventual publication of the scrolls. I'll only say that I was a bit too cocky, but that I've learnt my lesson. I think we all run into that from time to time - that over confidence. Speaking of which... what's the most common reason for a case cracking wide open for solution for you? I wish it was something clever, but most often it is leg work. Miles and miles of my sandals beating the pavement, as I go around the city chasing leads and suspects. Then again, there is the occasional spark of inspiration. I know time is a precious commodity, so I won't keep you much longer. Just a couple of questions. What's your favorite thing to do when you're not working a case? Spend the money I made in the last case. Makes sense. And one for humor - if you could meet anyone in the world, who would you choose? Probably Fortuna. I'd love to have a respectful chat with the goddess, and ask her to please chose someone else. Oh, dear. Now I really DO need to go find your memoirs. Felix, thank you for letting Assaph bring you over to visit. I have really enjoyed our chat.Assaph, thank you again for coming back for a return appearance.Any last words? You can find some of my shorter (though not sweeter) cases on my website. 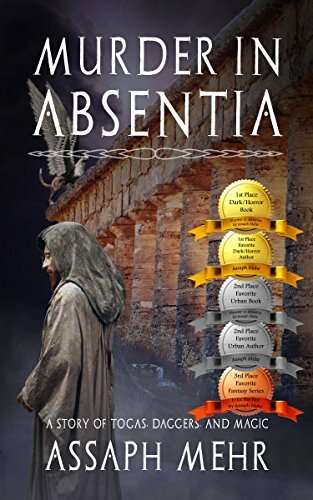 My first big case you can find published in your world with the title Murder In Absentia. Thanks Kat for having us both. It was a pleasure talking with you again. The pleasure's been mutual Assaph. Once again, thanks for making the long trip over to visit. If you've enjoyed the meeting Assaph and getting to know his character Felix, you can find out more about the pair on on Twitter, on Assaph's website, and on Facebook. Thank you everyone for stopping by today. Next week we'll have another author and character interview set, so make sure to check back then!